A New Approach to an Old Quiz. Last week at our iPad Academy training day, Ann Feldmann told me about an activity she did during a Twitter chat using the app Book Creator. The moderator designed a series of tasks for the participants to complete, then they compiled those tasks in a book. I’ve struggled every year with how to use the iPads in my Pop Culture Class as a creation device, but as Ann explained what she did during this chat, my mind started thinking about the Postmodernism test that my Pop Culture classes would be taking soon. I usually have them take a traditional quiz–matching, true/false, fill in the blank–basic-level Bloom’s Taxonomy kind of quiz, as a formative assessment to make sure they know the bare minimum about Postmodernism. What would happen if I changed the quiz entirely to a more interactive, application-of-knowledge kind of quiz? I designed five tasks for my students to complete. The tasks required a little bit of video, a little bit of writing, a little bit of Google image searching. Then, using Book Creator, the students compiled their knowledge into a book. I’ve graded one class’s quizzes, and I’m so impressed with what they’ve done. One issue I’ve had in the past with the summative exam over this unit is that students used the same examples provided in class discussion. On this quiz, I stipulated that the examples had to be original. I haven’t been disappointed once. Their examples have been fantastic. Also, I’ve loved watching their “selfie videos” as they explain different concepts in their own words, again with original examples. My room during my two sections of Pop Culture Studies today was a little noisy, but as I walked around helping students, I was thrilled with what I saw. I saw collaboration, as one of the tasks required students to ask another student to explain a concept on video. They were also often collaborating with each other on what examples would work and what examples wouldn’t. I saw focused engagement, as they knew they only had 47 minutes to complete the quiz. Ideally, they probably needed 55 minutes–a lesson to learn for next semester. But my point is that there wasn’t down time–and when students finished before others, they helped with exporting and turning in the books. But what impressed me the most was the quality of the questions I was getting. Most of the questions students asked me were not about the app itself, the questions were about the content. In the past when I’ve tried assessments like these, I have fielded so many questions about the app that I’ve wondered if any learning actually took place. Today, I didn’t have that same experience, which speaks to how user-friendly Book Creator is. Today would not have happened without the iPad Academy work day last week. 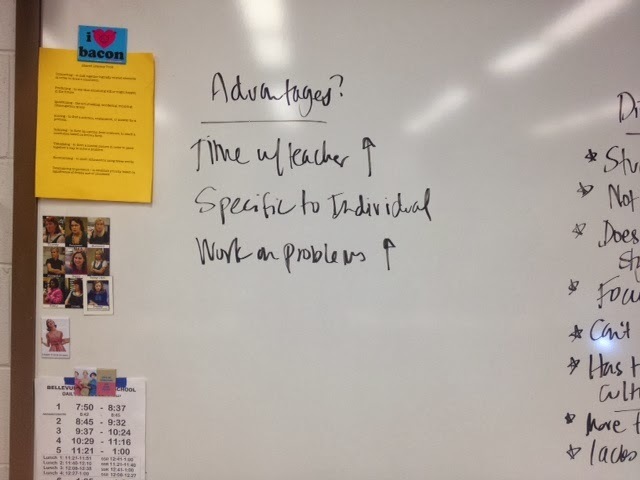 I rarely see Ann, and the session she ran about infusing creativity in the classroom led directly to today’s lesson plan. I had the gift of time to look at quizzes I’ve used in the past and wrote a new quiz that relied so much more on application and synthesis of knowledge than just basic recall. In a time when public schools are under more and more scrutiny for all the things they are doing wrong, it’s important the share the stories of when they do something right. And that’s exactly how I feel about iPad Academy. Occasionally I think about the kind of teacher I was 15 years ago when I started teaching, and I cringe a little. Control, order, and power ruled my mindset–and part of that, honestly, is necessary as a beginning teacher. Classroom management is the toughest part of the job, and without control, order, and power, a classroom can go a bit “Lord of the Flies” in a snap. I wasn’t a tyrant, really, but I remember bristling at the slightest variance of what I deemed necessary on any given day. This semester, I started posting a daily agenda. Students come in every day, log in to Google Classroom, and they see what the plan is. In Pop Culture Studies, that means most days I have links to the articles and videos we’ll watch, so those who are absent can still keep up. Today as I was getting ready to start with the order of the day, a student raised his hand. So we started with the third link and had a robust discussion that went so much further and into much more detail than I expected. Part of what I’ve gained in teaching with iPads is the ability to roll with whatever happens in a given day–whether it’s a network that’s down, or an app that quit working or a Google search about a product someone mentioned in passing that actually augments the discussion at hand or a student who opens the third link on his own instead of waiting for his teacher to tell him what to do. It’s a freeing mindset, one that actually makes me happier and (I think) nicer to my students. I welcome their questions and love when they teach me something–which, in a class full of iPads or iMacs and the pesky Adobe Creative Suite, happens nearly every day. The world I teach in now is so different from the world I started teaching in 15 years ago, and I’m a different teacher. I’m glad to keep making gains in my profession. It’s been a while since I blogged about teaching with iPads–when I first started teaching with them in January 2013, it was so new and overwhelming, and now it’s just part of my life. I’ve found a good rhythm, and apps that work best for my classes. As I write this, my Journalistic Writing students are tapping away, working on their feature stories (due today! ), but I told them if they need a break from the “assigned work” to go ahead and switch over to their blogs. They have 47 minutes; they can use it how it works best for the tasks at hand. Yesterday, I let them choose peer editors, and a good chunk of the class time, students read each others’ stories and then conferenced about what they read. They shared their stories via Google Docs, and I gave them specific pitfalls to highlight and comment on. I explained that I just had to provide all the examples myself and use the projector, but throughout the day, her question stuck with me. The flexibility they provide, the work students are able to complete in my classroom, the feedback they get from both me and their peers–it’s all invaluable. I can’t imagine teaching without iPads anymore. As part of our Internet unit in Pop Culture last week, we spent a day talking about flipped classrooms. I asked for some explanation about how technology has made their learning better. Most of the responses focused on how easier it was to find information. I also asked in the survey if they knew what a flipped classroom was. Out of 28 in my 2nd hour, only 2 knew. 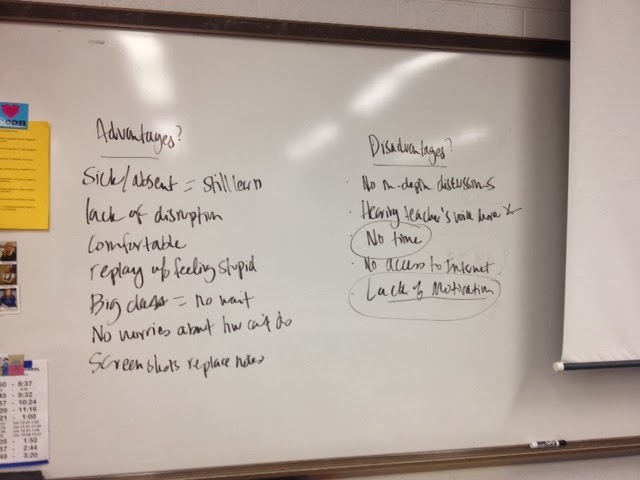 Notice this class’s list of disadvantages are nearly triple their list of advantages. Also, scroll up and look at their learning styles: 2/3 prefer rather traditional ways of learning. I don’t know that any of this data is particularly significant (though I found it quite interesting that my 6th hour–mostly kinesthetic learners–listed more advantages to a flipped classroom than my 2nd hour). 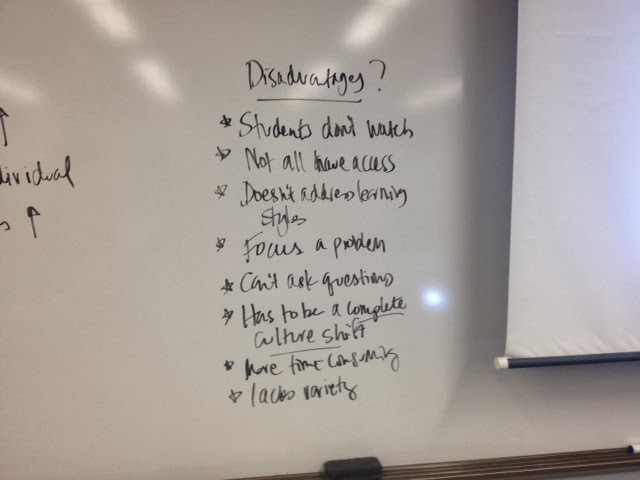 But in both conversations, most of the students were quite skeptical that a flipped model would be at all effective without a complete cultural shift district-wide. I was also quite impressed with their sensitivity to families without access. And when I shared a summary of this article with them, they declared that expecting families to hang out at McDonald’s to do homework was not acceptable, either. So I put this out there not as any solution, but as informal data from 50 students who, for the most part, don’t think flipped classrooms are a reasonable expectation. I have my own fears and misconceptions about flipped classrooms–after all, I taught English for several years and if students won’t read to be prepared for discussion, I’m not convinced watching a video will be much better. I also think that as students experience self-directed learning at a younger age, by the time they get to the high school level, they will come to expect it. Because right now, when I give students freedom to learn as they wish, their fear is palpable. In my 5th hour Journalism class this Friday, students will teach an element of media press law they’ve been studying for 5 weeks. Last Friday (their last classroom work day), I had to remind them that they could not be afraid of the freedom I was giving them. They were so concerned with doing the project “right,” that they forgot to just learn. So we’ll see how Friday goes, but I’m really more interested in what my classroom will look like in five short years, when the 6th graders in my district who are currently part of the iPad Academy arrive in my classroom. I have a feeling my classroom will look quite different than it does now. Today I taught two classes how to use the Explain Everything app. In a thoughtful, logical way that made sense to both them and me. And when they found the lightsaber laser pointers, I knew I had taught the young padawans well and could let them loose. But more importantly, I wasn’t exhausted after I taught them the app. I wasn’t stressed out or frustrated. I wasn’t sweating or short of breath or having heart palpitations. It was just a normal day in class. And I’m sharing this because I cannot underscore what a revelation this was to me at the end of the day, giving them an assignment, teaching them an app and letting them go and not even really thinking twice about it. Last year when I first had the iPads, I was so unsure, such a bundle of nerves, couldn’t really think straight when teaching a new app and I was physically spent on the days I tried. I often felt like such a colossal failure, and that the opportunity to have iPads was wasted on me and I should have just given them back after the first day. But every semester, I’ve learned more about how to best utilize the iPads in class, I’ve learned how to separate the flashy apps form the functional apps, and I’ve learned that it’s okay to take an extra day if the kids are engaged and working–because even though we don’t assess skills like creating and troubleshooting, those are two skills they’ll need once they graduate, and producing content on an iPad allows them to stretch both their creativity and their troubleshooting abilities. So I’m just putting this out there to anyone implementing any new technology in their classroom, that if you ever feel overwhelmed, well, first of all, you’re so not alone. And second, one day, you won’t even realize just how easy it’s become.